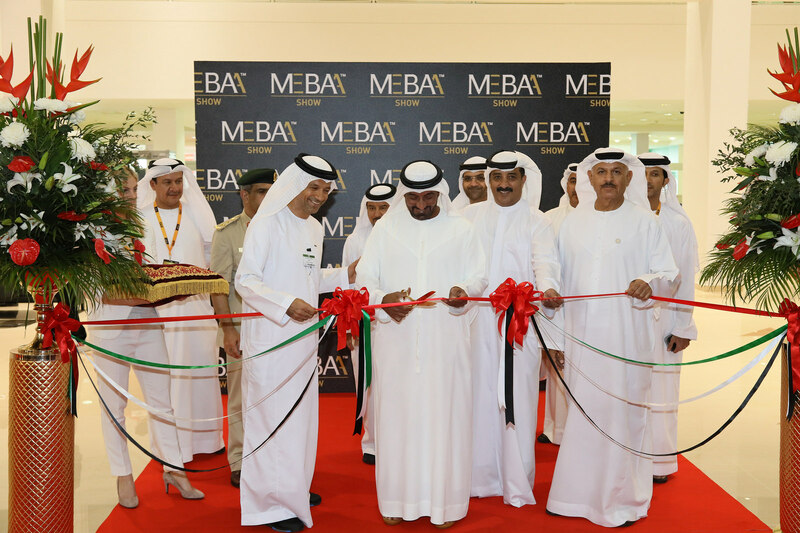 6 December, 2016: The MEBAA Show – the biennial event organised by the Middle East and North Africa Business Aviation (MEBAA) – was inaugurated this morning by His Highness Ahmed bin Saeed Al Maktoum, President of Dubai Civil Aviation Authority, CEO and Chairman of the Emirates Group and Chairman of Dubai World, widely regarded as the man who put Dubai on the global aviation map. His Highness undertook a comprehensive tour encompassing a number of local and international exhibitors in both the main hall and on the static display, both local and international. One of the first stops on his lengthy tour was Rockwell Collins, the US-headquartered avionics electronics experts. Sheikh Ahmed paused to look at the company's cabin management system, Venue, flight support services and Pro Line Fusion, its cutting-edge flight deck solution. Touring the hall, Sheikh Ahmed took the time to talk with exhibitors including CAE, Haeco Private Jets, Executive Gourmet, the US Pavilion, UAS, Harrods Aviation, SD Pro, Sea Prime, X Jet, DC Aviation, Execujet, and the GDC Group. On the static display, his highness, accompanied by Ali Ahmed Alnaqbi, Founding Chairman of MEBAA, and a VIP entourage, entered a number of aircraft, including Qatar Executive's Gulfstream G650ER, one of the world’s fastest business jets, which can seat up to 13 passengers and fly non-stop from the Middle East to North America. “The G650ER is one of the world’s most technologically advanced next-generation aircraft. For Qatar Executive and our customers it truly represents the future of private air travel, offering a superior flying experience with unrivalled design, comfort and class,” said Executive Vice President, Qatar Executive, Ettore Rodaro. The MEBAA Show, which takes place until Thursday December 8, at DWC, Airshow Site, is the first and only show dedicated to business aviation in the Middle East. It is expected to attract more than 9,000 regional and global business aviation professionals this year, flocking to the Dubai site to visit some of the 460 exhibitors, network with industry peers and tour almost 45 aircraft on the site's static display. Sheikh Ahmed's thorough tour of the static display took in most of the aircraft exhibited, from the 6-9 seater single turbo prop Pilatus Aircraft PC 12 NG, to the enormous 77 seater Airbus 340, displayed by Saudi Arabia's Sky Prime. His aircraft tours included Boeing Business Jets, Bombardier, Embraer, Honda Aircraft Company and Textron Aviation. Exhibitors include companies from the UAE, wider Middle East, Europe, North America, Asia and Africa, representing the breadth of the business aviation industry, from OEM’s and equipment manufacturers, to charter, carrier and management services. The MEBAA Show takes place at DWC, Airshow Site, from 06-08 December. Find out more at www.mebaa.aero.